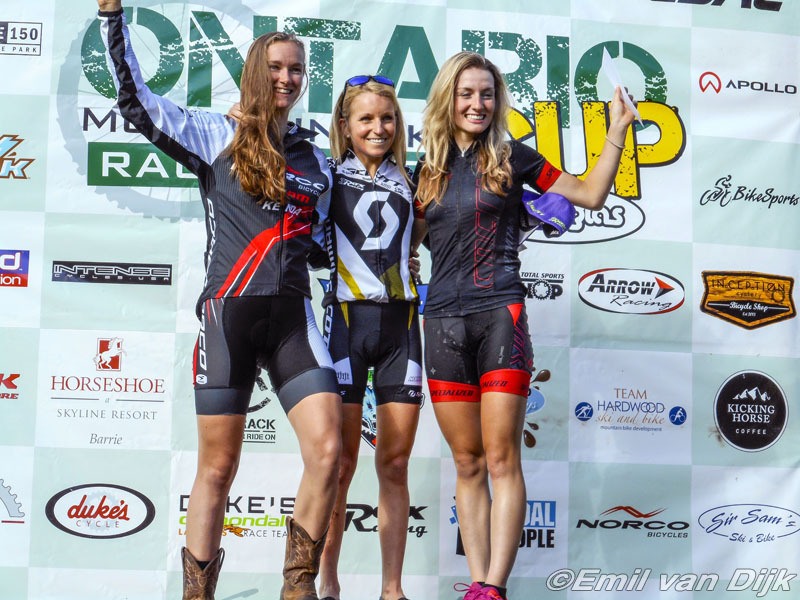 The 2014 Scott Ontario Cup mountain bike race series presented by Plastiglas concluded on Sunday with the cross-country provincial championships, held at Horseshoe Valley resort, near Barrie. 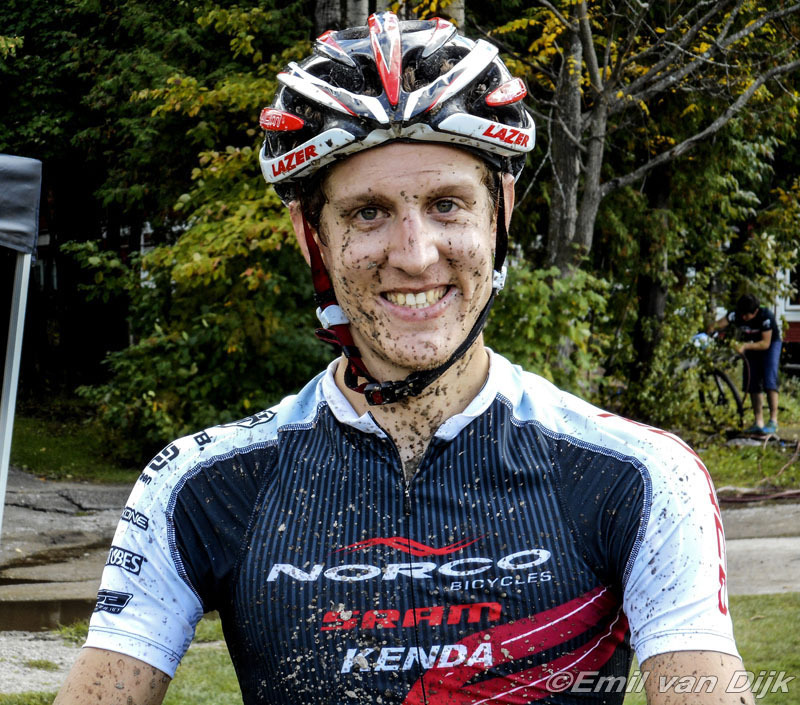 Mikaela Kofman (Scott-3Rox Racing) and Evan McNeely (Norco Factory) claimed victory in their respective Elite categories. Although the day's feature races took place under dry skies, heavy rain on Saturday and early Sunday left a number of course sections quite muddy, making a challenging track even more formidable. Laura Bietola (Specialized Racing Canada) led through the start loop but Haley Smith (Norco Factory) was first into the opening singletrack. Riding with an injured right hand (a broken finger and a split joint suffered in a crash prior to the world championships), Kofman was content to follow in the early going. "I can't really brake or shift properly so I didn't know how today was going to feel," explained Kofman, "but when I got out there it was 'You know what? I've got something in the tank so I'm just going to give'er' ". That she did, moving into the lead partway through the first lap and pulling away from her rivals, but struggling with braking issues exacerbated by the slick conditions. "I think I had more crashes today than I've had all season because I don't have very much control with my right hand. There was a lot more front brake than rear brake, and with the mud that's not a good idea." Once Kofman increased the tempo, there was little her erstwhile companions could do. "She went and I didn't feel like I could match her," related Smith, who was the top Under-23 rider. "so I let her do her thing and I just rode my race and had fun." "It was too hard so I let it off a bit," said third-place Bietola, in reference to Kofman's pace. "I had to find my own rhythm. I guess Haley didn't gain much more time after the first lap. I could see her up the gravel climb every time but I couldn't close it. I'm happy I was able to end the season with a good race." 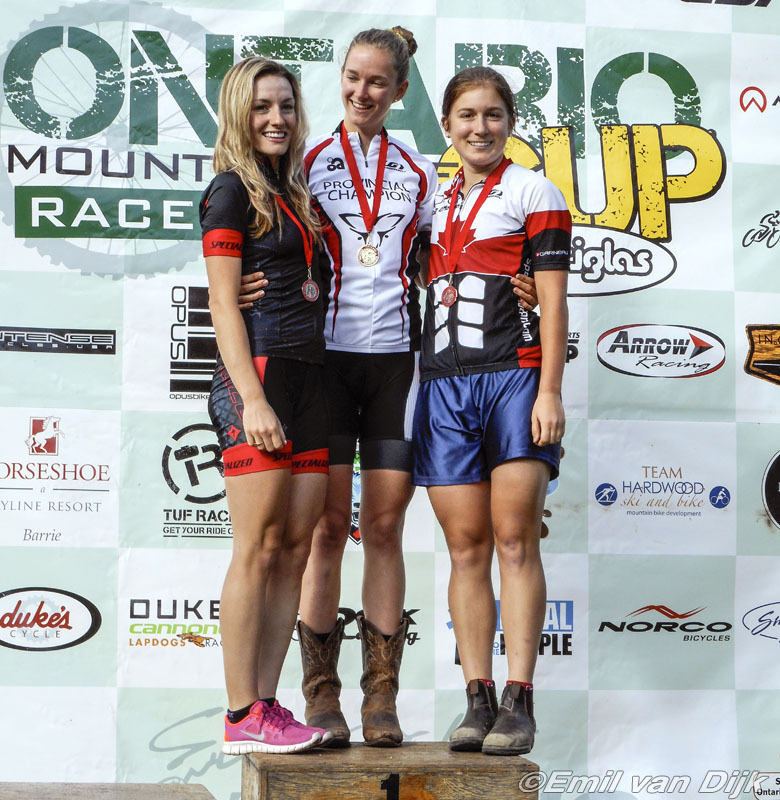 Elyse Nieuwold (Team Spoke O'Motion) put in a solid effort to finish fourth overall (third amongst the U23's), followed by Mandy Dreyer (TUF RACK Racing) and Victoria Giangrande (Trek Store CC). Showing plenty of early speed was Jacob McClelland (AWI Racing), followed closely by Matt Martindill, but it was McNeely who sprinted into the lead before the first woods section. "With all the rain I knew that the course had probably changed quite a bit so I wanted to lead the first singletrack just to have a clear track in front of me." Although Marc-Antoine Nadon (Scott-3Rox Racing) was able to keep him in sight for the first lap, McNeely's initial acceleration proved decisive as he never relinquished the lead. 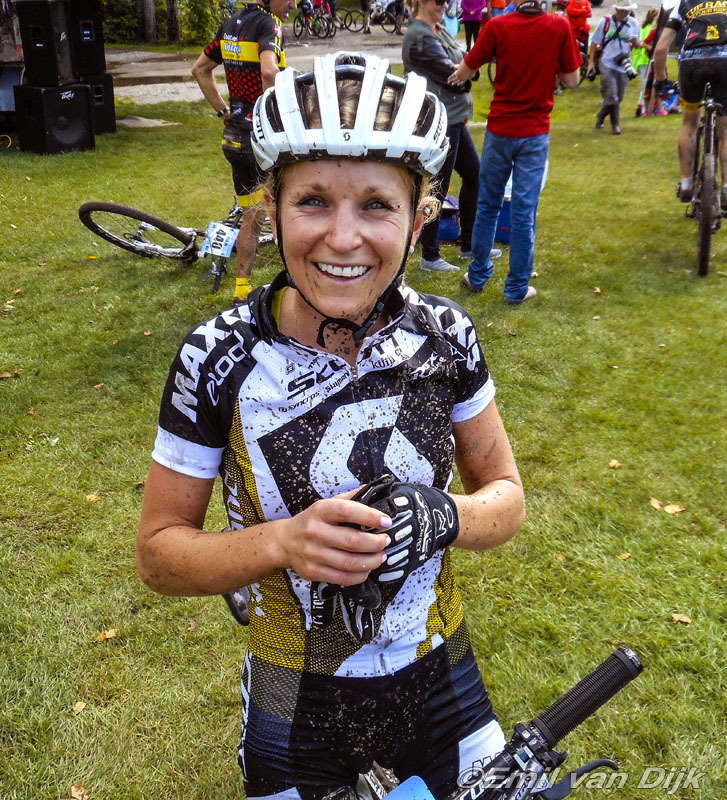 "I rode my own pace and rode everyone off my wheel and just kept riding for the next five laps." 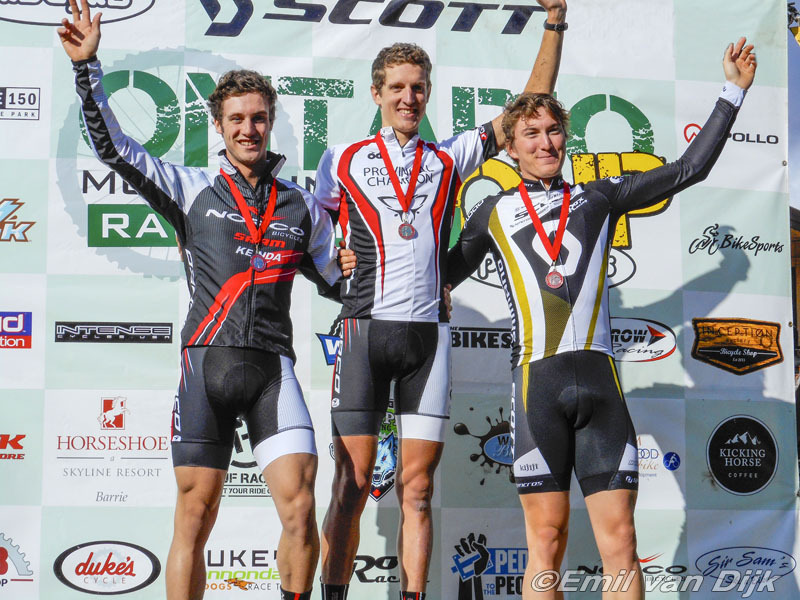 His final mountain bike race of the season, and his final race as a U23 was also McNeely's first win of 2014. An interesting battle for the remaining podium spots was brewing in McNeely's wake. At first it appeared that Nadon was comfortably ensconced in second, with Martindill and Peter Disera (Norco Factory) fighting for third. Further back was Davis Ross (Team Bikeland), who had McClelland for company. On the third lap Ross crashed on a slippery descent, forcing his withdrawal, while early on lap four Nadon, Martindill and Disera found themselves together, with the youngsters trying to put the 33-year old Martindill on the back foot. "They joined up and hammered pretty hard," related Martindill. " I kind of hung on, then crashed on the big sloppy climb at the back, but then I caught Marc on the top of the climb. Peter was pretty steady and kept a gap, and I kept a gap on Marc. I was having a bit of difficulty on the slick climbs because of my tire choice, but where it was medium-dry it was really good." Disera rolled home second, with Martindill third, and, by virtue of being the fastest non-U23 rider, a provincial champion. "I wasn't thinking about age. I was just racing....and hurting." 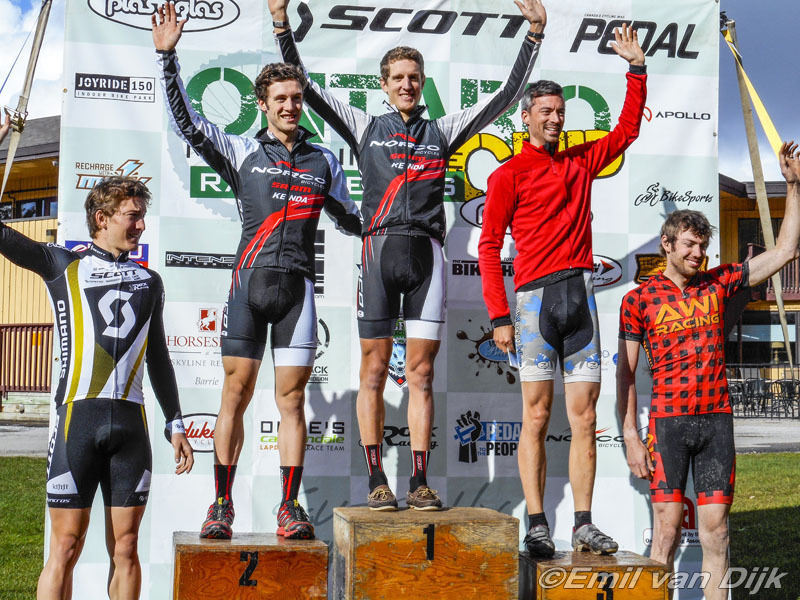 - Former provincial champions Peter Glassford (Trek Canada) and Andrew Watson (Norco Factory) were in attendance but did not take the start, Glassford due to illness and Watson because of injury. - O-Cup regular Mark Winfield (Team Bikeland) was absent, as he is enrolled in medical school at Trinity College in Dublin, Ireland. - The payout in the Junior Expert Men's race was richer than usual, thanks to Scott-3Rox pro Derek Zandstra, who donated his winnings from the O-Cup opener at Woodnewton. - Since 2010, Scott-3Rox Racing has owned the Elite Women's provincial championship, with either Mikaela Kofman or Amanda Sin winning the title. Sin, who won in '10, '11 and '13, has moved to British Columbia, so, barring new team personnel, Kofman shoulders the responsibility going forward. - A helping hand from Norco Factory team manager Kevin Haviland saved the day for Jacob McClelland. Nearing the end of the penultimate lap, McClelland rolled over an obstacle but landed with his front wheel askew, ripping off his tubular tire in the process. After a brief jog to the tech zone, he was given a spare wheel with which to finish the race.